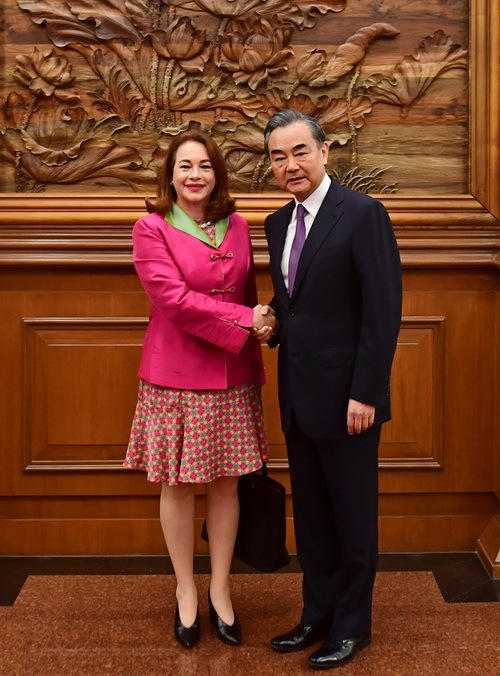 On August 6, 2018, State Councilor and Foreign Minister Wang Yi held talks with President of the 73rd Session of the United Nations (UN) General Assembly Maria Fernanda Espinosa in Beijing. Wang Yi expressed that the current international landscape is undergoing major changes and adjustments, and unilateralism, protectionism and populism are on the rise, adding unstable and uncertain factors to the international situation. The international community should strengthen the consensus on multilateralism, maintain the authority and role of the UN, safeguard the international system with the purposes and principles of the UN Charter as the core, and promote economic globalization to develop towards a more open, inclusive, universally beneficial, balanced, and win-win direction. All parties should firmly oppose unilateral trade protectionism, defend international rules and the rule of law, and safeguard the common interests of people around the world. Wang Yi noted that China is a firm supporter, defender and practitioner of multilateralism. President Xi Jinping proposed to build a community with a shared future for mankind, which is not only the inheritance and development of the spirit of the UN Charter, but also the best interpretation to multilateralism. The Belt and Road Initiative is the largest public product the Chinese side has provided for the world. The proposition of the Initiative is an important action to implement the idea of building a community with a shared future for mankind, as well as an important measure to carry forward multilateralism. China will fully support the work of the President of the UN General Assembly, and improve the efficiency and capability of tackling global challenges, in a bid to make the UN General Assembly play a greater role in the three pillars of the work of the UN, namely the maintenance of peace, the promotion of development and the assurance of human rights. Maria Fernanda Espinosa expressed that she visited China first after her election as President of the 73rd Session of the UN General Assembly, which embodied the great importance she attached to China. Maria Fernanda Espinosa totally agreed with Wang Yi on his analysis of the challenges and risks facing the current international situation, and believed that the international community must enhance cooperation, adhere to advancing the process of multilateralism, and safeguard international rules and orders. Maria Fernanda Espinosa thanked China for consistently and firmly committing to supporting multilateralism and the role of the UN and for playing an important constructive role in this regard. As the Belt and Road Initiative will make positive contributions to promoting global development, she will continue supporting the Initiative. Maria Fernanda Espinosa hoped that the Chinese side will continue supporting the work of the UN General Assembly in various aspects, and expected to further enhance cooperation with the Chinese side.